Lecture Summary: During the lecture, we talked about romanticism and the industrial revolution. 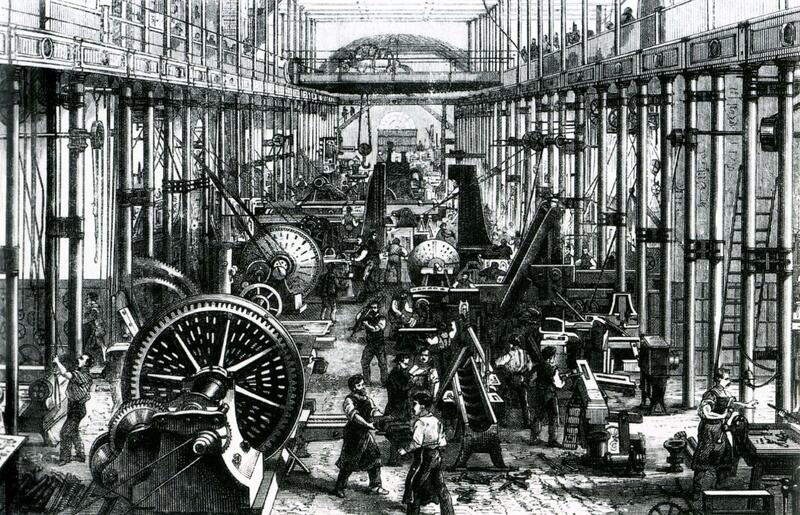 The 1750’s was the time of mass production in large cities, and, therefore mass consumption. There were more jobs, more money for people to spend on secondary needs, and more things were made for them to buy. Now, there was a huge need for advertising, so people were creating posters, and more newspapers were printed. The style of architecture was changing a lot as well. Since people started producing new materials like iron and steel, architecture and engineering began to separate. Architects started to focus more on the aesthetic aspect of the buildings they’d been hired to work on. Neoclassicism was yet another return to the Classical Orders of Greek and Roman Antiquity on a monumental level, except with the addition of development of all the engineering advances and new materials of the modern era. It was marked by large-scale structures, supported and/or decorated with columns, and enlarged Renaissance-style domes. Sometimes columns were multiplied and stacked, to create an impression of height, while facades were decorated with a combination of colonnades, rotundas and porticoes. Neoclassicism was born in Italy, although it became especially active in France largely because of the presence of French designers trained at the French Academy in Rome. Classical features had begun appearing in architectural design at the end of Louis XVI’s reign, who began the building of the Palace of Versailles, one of the amazing masterpieces of architecture. This style was then adopted during the first Napoleonic empire: High Society employed it on their private homes, along with extras like faux ruins, follies, grottos, and fountains to decorate the landscape, while more experimental architects used it to design a range of civic structures. Jacques-Germain Soufflot was a French architect, a leader in the development of Neoclassical architecture and the designer of the Church of Sainte-Geneviève (the Panthéon) in Paris. He claimed to be self- taught but he lived in Rome for about 20 years and studied the classical monuments there as well as the Greek temples at Paestum. One of his most influential accomplishments was designing of Sainte-Geneviève, which was intended to be a church. However, because of the classical origins of the design, when the Revolution abolished religion, the church was secularized and renamed the Panthéon. Unfortunately, much of the decoration was removed. The effect of a light interior space was destroyed, resulting in the somewhat gloomy monument that the Panthéon is today.